Tennis Server - Tennis Warrior - Battling a backboard! When I was learning to play tennis I would often hit against a wall or backboard for practice. I learned quickly that you can never beat a backboard! As with gambling, the odds are with the house. So with tennis the odds are with the wall. The darn ball just keeps coming back! I have beaten a few ball machines because they got jammed or ran out of balls, but I have never been victorious against a wall. The backboards I hit against never fell down; the buildings I hit against never collapsed. The good news is the backboard is the perfect partner to improve your game. You can hit forehands, backhands, volleys, overheads and serves against a backboard. I always liked to find a backboard with a line about the height of the net across the board. If I were on a wall I would always find a way to create my own line with string or chalk. I loved having a target! You can be as creative as you like against a wall. First, I would simply hit forehands and backhands. Next I would hit my forehand to my backhand and my backhand to my forehand to see if I could keep it going. This would simulate hitting crosscourt shots. 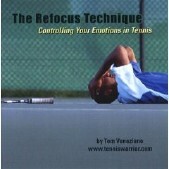 Then I would hit my forehand to my forehand and backhand to my backhand to simulate the down-the-line shot. As my control improved I would do a number of different patterns to practice my control. I would try to keep the ball 3 to 6 feet above the net, but sometimes to test my control I would attempt to hit just inches above the net. Of course if you do not have much control yet, just keep hitting one shot over and over and over again until you develop a measure of control..it's not easy!!! To serve I would measure 39 feet from the backboard (if there is room), place a piece of tape and use the tape as the baseline in order to serve. For volleys I would move up close and fire away to sharpen up my reflexes. I would hit overheads by serving the ball so that it lands on the ground near the wall and bounces off the wall in an upward direction. After my warm-up the fun begins! Now I pretend I'm at Wimbledon. I serve from behind the baseline and play out points with a fictitious opponent. 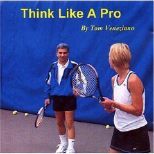 I hit the serve, follow it with some groundstrokes and move the ball around, driving my imaginary opponent crazy. I'm feeling pretty good. Proud in fact that I have my opponent on the move! After a long, gruesome rally I see an opening and advance fearlessly to the net. At the net my opponent puts up a admirable fight, but I hang in there and hit a crosscourt volley for an angled winner. Game, set, match, Mr. Veneziano! Unfortunately, I now had to go find the ball that I pummeled for the angled winner. You see, in the long run the wall always wins! There is one more simple drill you can do against a backboard that was always one of my favorites. I would use tape to place a square on the wall about 3 feet by 3 feet. I would then practice until I could hit a number of backhands or forehands into that square. The square gave me a more defined target to hit which, in turn, improved my accuracy. Be creative! Anything goes as long as you are hitting tennis balls! Anyway, anywhere, anytime!